Our fall/winter vegetables are taking off. The lettuce in the bed pictured above finally sprouted, after three tries. The seed I started in fiber pots in a shadier spot took off immediately, but this bed with afternoon sun was slow to go. Next time around, I'll try a trick Renee Shepherd of Renee's Garden Seeds told me about recently: put the seed in the fridge for a day before planting it. I interviewed Shepherd recently for a short piece on arugula I wrote for the LA Times. I've planted four kinds of arugula this year because--need I say it?--I love it, and it's so easy to grow. You can buy both annual and perennial arugula. Extra! Read all about it in my arugula report. Some summer treats still linger, including bell peppers, a lone watermelon I hope will ripen, a few strawberries, and basil. 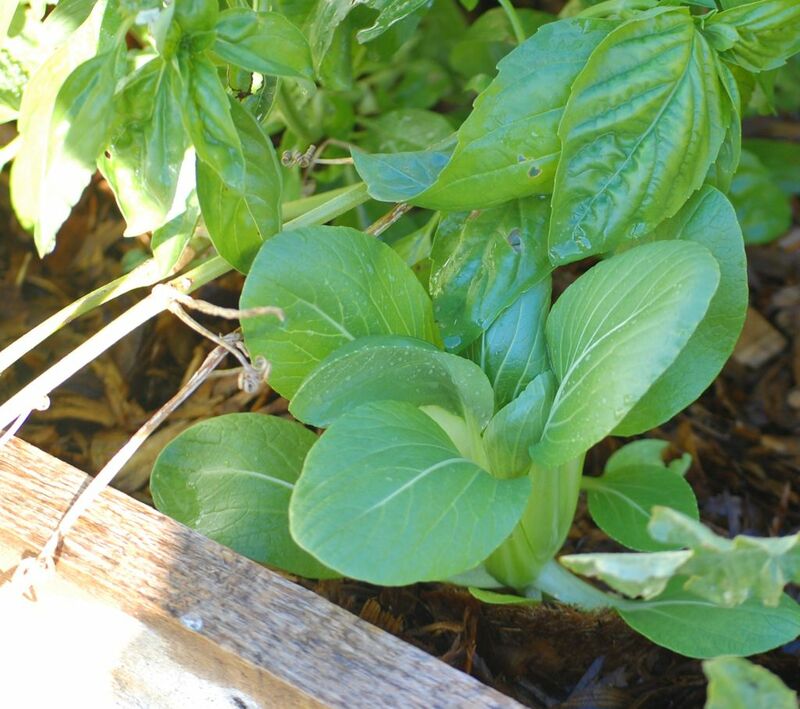 Some of our pak choi (below) is ready to harvest, and the broccoli is bursting. The peas are producing their first pods (above). I've also started cilantro, parsley, beans, beets, and chevril. I highly recommend the latter. I like to toss this delicate-flavored herb into salads; it also complements all things eggy quite well. Chevril doesn't dry well, so it's best to grow it. You know you're talking to a plant person when you ask to take her photo and tells you she wants to do a little grooming first--not herself, mind you, just the plants. Snipping some wispy brown leaves off a couple chives, Shirley Kerins, manager of plant production and plant sales for the Huntington Library and Botanical Gardens, told me it was more important that the plants look good. I went to talk to Kerins for a recent piece on alliums I wrote for the LA Times. It's a huge genus--some 500 species--and, alas, I only had room to discuss the ornamental kinds. But they have plenty in common with their culinary brethren. Kerins searched among a vast field of flats for some of the long, slender leaved onions, chives and garlic that make up this group of plants. "It’s a monocot," she explained. "You can tell a monocot because the [leaf] veins run parallel, as opposed to a dicot where the veins are netted." Among Kerins' favorites are chives. "Every one who cooks should have chives in their garden. Because it is so easy to run out and snip off the leaves," she says. 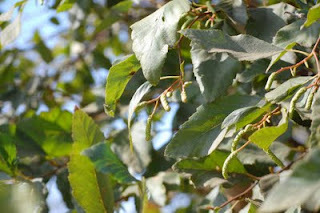 She recommends snipping the leaves down at the base, taking an entire strand, rather than just trimming the top of the plant. New leaves will sprout up and the plant will look better. Kerins introduced me to a new variety of garlic chives (Allium Tuberosum) called Nira. Like other varieties it has an oniony taste with a tinge of garlic. But it's flattened blades fan out like a palm frond. Kerins says the poofs of white or purple-pink flowers chives produce are a pretty addition to a kitchen garden or the front of flower bed. Plus, she advises, "you can pull those flowers apart and sprinkle them on your salad, and you get a crunch you don’t get from the leaves, but you get the same flavor." To learn a bit about ornamental alliums, including the native species, click here. Last Sunday, my family strolled this gorgeous 10-acre park just west of downtown LA. Unprompted, my husband commented, "Every neighborhood should have a park like this." With my heart aflutter over the large palette of mostly native plants, I was thinking something similar. Kudos to landscape architect Mia Lehrer for a gorgeous design. 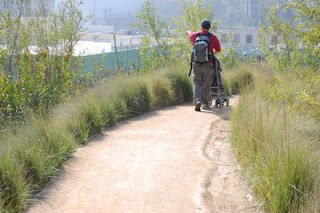 I can't help wishing some of the degraded stretches of Griffith Park looked more like this. 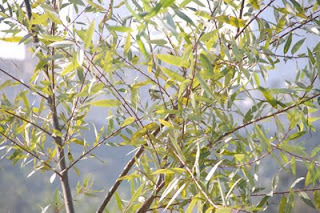 Larks scurried along a grassy gully, yellow-rumped warbles flashed their buttery backsides, and white-crowned sparrows seemed to be playing hide-and-seek under some alders. Grasses don't usually thrill me. But the fine texture of the bunch grasses here on a misty, soft-lit morning was magical. I also enjoyed the intermingling of red-blossomed California fuchsia with petite roses bursting with red hips. 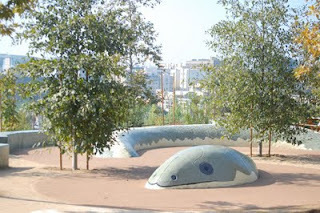 In the children's play area, my son enjoyed walking atop this snake, and sliding down a giant turtle. The Santa Monica Mountains Conservancy created Vista Hermosa with funding from two state water bonds, and LA's proposition 12. An amiable park ranger was on hand the day we visited. After the park, we lit out for lunch in Japan town. 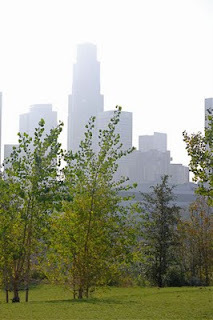 It was a sweet itinerary for an increasingly beautiful city. I've been peering anxiously at little sprouts in my garden. I usually scatter wildflower seed before, during or immediately after the first fall rain. This year, dreaming of spring, I joyously tossed seed on a drizzly day. But my hopes started to wither with the subsequent Santa Ana winds and two heat waves. Yes, the poppies had reseeded on their own, but, aside from the nonnative corn flowers, there seemed to be few other species. I started to pull some of the overabundant poppies. Sheltered underneath I found clarkias, lupines and other seedlings. 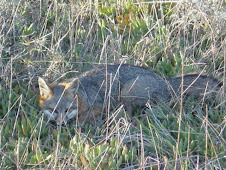 Those I'd strewn in shadier spots had survived, too. California poppies seem to thrive just about anywhere in Southern California. (Just don't expect them to grow if you sow them in summer. In my experience, they'll wait for fall.) 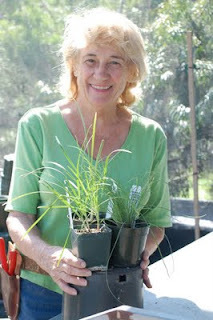 As Barbara Eisenstein said in a recent class at the LA County Arboretum, these annuals with long tap roots seem to condition the soil, breaking it up and making it more hospitable for future generations of plants. The first year I ripped out lawn and replaced it with natives, poppies were the only native annual that made a go of it. But as the years have gone by, more of them have taken root in the garden. 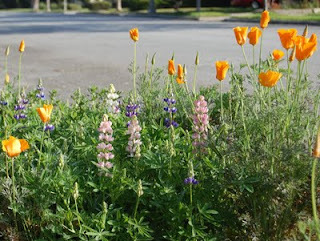 In nature, poppies plants mingle with lupines, creating a gorgeous carpet of blue and orange. Lupines also improve garden soil by hosting bacteria that convert nitrogen gas in the air into a form other plants can use. The lupines sprouting with poppies in my parkway are probably not native to California, but they reseed in this hard-to-grow spot. (I do grow native lupines elsewhere.) I think their origin is a lovely Botanical Interests mix called Sweet Baby Blues. 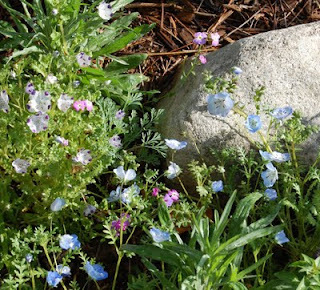 This wildflower mix includes several California natives including desert bluebells (Phacelia campanularia), baby blue eyes (Nemophila menziesii) and five spot (Nemophila maculata). Elegant claria (Clarkia unguiculata) also self-sows in my garden, though I've thrown more down this year to ensure it's presence. I adore its tall spikes of pink and magenta flowers. I've also scattered farewell to spring (Clarkia amoena) and plan to try some Clarkia purpurea (look them up on Theodore Payne's fabulous California Natives Wiki). Harder to grow--at least for me--are the two Nemophila species pictured below, Nemophila maculata and Nemophila menziesii. I've tried them in several shady or part-shade spots, but so far they favor only one nook. I enthusiastically recommend two other plants that aren't annuals but low-growing natives that reseed easily. First, blue-eyed grass (Sisyrinchium bellum). I'm at a loss to explain my passion for these petite, purple members of the iris family with grass-like foliage (below). They look lovely clustered around one of my bird baths. Blue flax (Linum lewisii) produces similarly shaped and sized blue flowers, also in clumps. Various species of Linum are native to much of the American West. 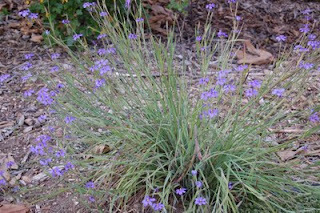 I planted it to bring a little blue to my very purple native plant palette. You can find blue flax and the desert bluebell seeds on racks in many mainstream nurseries. For more on spectacular wildflowers, click to my recent piece on the rare flowers that bloom after wildfires. We've been enjoying some delicious strawberries this fall. 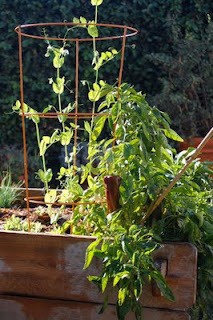 They used grow in an inch-high raised bed, but I was constantly battling slugs and pillbugs. 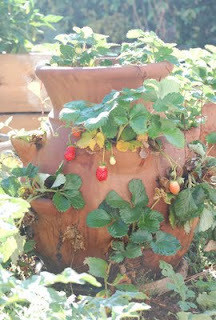 They're faring much better in two pots, including the strawberry pot pictured above. 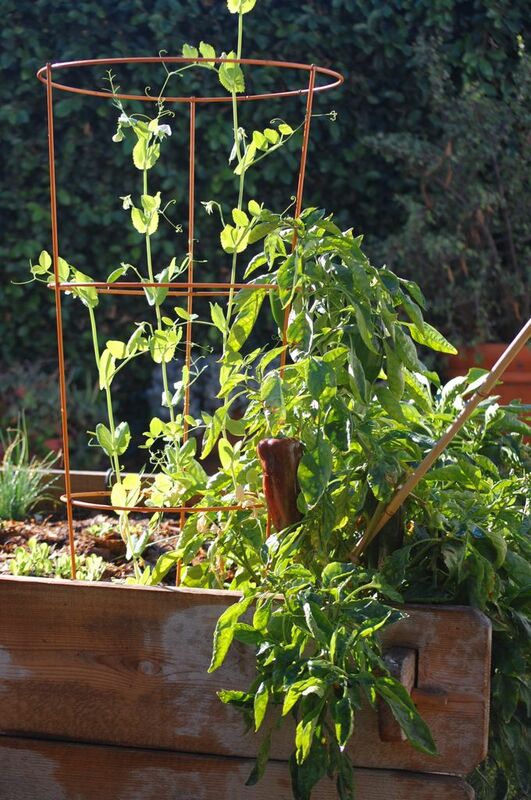 Wondering how to fill your raised beds and pots? 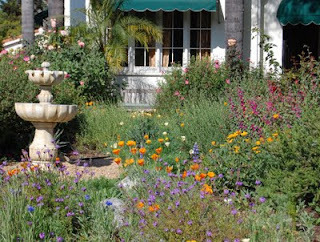 I offer three possibilities in a recent piece for the Los Angeles Times: Experts Give the Scoop on Potting Mix.